The Pittsburgh Pirates head to Nationals Park on Saturday, September 30, 2017 to take on the Washington Nationals. The expected starting pitchers are Jameson Taillon for the Pirates and Max Scherzer for the Nationals. The odds for this matchup have Pittsburgh at +213 and Washington at -240. The Pirates have a 62-91-6 over/under mark and a 85-74-0 run line record. The Nationals are 76-83-0 against the run line and have a 68-80-11 over/under record. The Pirates have a 73-86 overall record this season. Starting pitcher Jameson Taillon has a 8-7 record with an earned run average of 4.62 and a WHIP of 1.52. He has 120 strikeouts over his 126.2 innings pitched and he's given up 148 hits. He allows 10.5 hits per 9 innings and he has a FIP of 3.55. The bullpen has an earned run average of 3.84 and they have given up 506 base hits on the year. Teams are hitting .245 against the bullpen and they've struck out 484 hitters and walked 210 batters. As a team, Pittsburgh allows 9.1 hits per nine innings while striking out 7.9 batters per nine innings. They are 13th in the league in team earned run average at 4.22. The Pirates pitchers collectively have given up 1,432 base hits and 663 earned runs. They have allowed 177 home runs this season, ranking them 28th in the league. Pittsburgh as a pitching staff has walked 501 batters and struck out 1,235. They have walked 3.2 men per 9 innings while striking out 7.9 per 9. They have a team WHIP of 1.37 and their FIP as a unit is 4.22. As a team Pittsburgh is hitting .244, good for 26th in the league. The Pirates hold a .387 team slugging percentage and an on-base percentage of .317, which is good for 21st in baseball. They rank 27th in MLB with 8.2 hits per game. Andrew McCutchen is hitting .279 with an on-base percentage of .364. He has 157 hits this season in 563 at bats with 87 runs batted in. He has a slugging percentage of .485 and an OPS+ of 121. Josh Bell is hitting .256 this year and he has an on-base percentage of .333. He has totaled 138 hits and he has driven in 89 men in 539 at bats. His OPS+ is 108 while his slugging percentage is at .471. The Pirates have 1,308 hits, including 245 doubles and 151 home runs. Pittsburgh has walked 504 times so far this season and they have struck out 1,185 times as a unit. They have left 1,108 men on base and have a team OPS of .705. They score 4.1 runs per contest and have scored a total of 652 runs this year. Washington has a 96-63 overall mark this year. With an earned run average of 2.55, Max Scherzer has a 16-6 record and a 0.91 WHIP. He has 263 strikeouts over the 197.1 innings he's pitched. He's also given up 125 hits. He allows 5.7 hits per nine innings and his FIP stands at 2.92. The bullpen has an earned run average of 4.32 and they have given up 449 base hits on the year. Teams are hitting .250 against the Nationals bullpen. Their relievers have struck out 432 batters and walked 156 opposing hitters. As a team, Washington allows 8.1 hits per nine innings while striking out 9.1 batters per nine innings. They are 6th in the league in team earned run average at 3.85. The Nationals pitchers as a team have surrendered 1,277 base knocks and 607 earned runs this season. They have given up 189 home runs this year, which ranks 22nd in Major League Baseball. Washington as a staff has walked 480 hitters and struck out 1,429 batters. They give up a walk 3 times per 9 innings while they strike out 9.1 per 9. Their team WHIP is 1.24 while their FIP as a staff is 4.01. As a team, they are batting .265, good for 4th in the league. The Nationals hold a .448 team slugging percentage and an on-base percentage of .332, which is good for 9th in baseball. They rank 5th in MLB with 9.1 hits per contest. Daniel Murphy comes into this matchup batting .319 with an OBP of .383. He has 167 hits this year along with 92 RBI in 523 AB's. He maintains a slugging percentage of .545 with an OPS+ of 137. Anthony Rendon is hitting .299 this season and he has an OBP of .403. He has collected 150 hits in 501 at bats while driving in 97 runs. He has an OPS+ of 139 and a slugging percentage of .529. The Nationals as a unit have 1,445 base hits, including 305 doubles and 210 homers. Washington has walked 532 times this year and they have struck out on 1,300 occasions. They have had 1,077 men left on base and have an OPS of .780. They have scored 5.06 runs per game and totaled 804 runs this season. 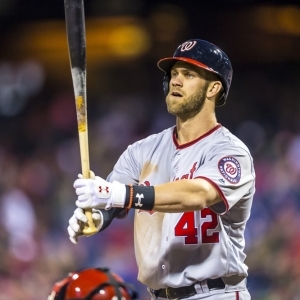 Who will win tonight's Pirates/Nationals MLB game against the spread?